Drive Up, Down and as Far as You Can Without Flipping Over. Silly-looking physics are hilarious to see in action. Great variety of upgradeable vehicles. Good number of challenging tracks. Most of the time, we like to think that gravity is our best friend. It ensures that we stay rooted to the earth and not float up into the vacuum of space. However, gravity is also a harsh mistress. Things never fall neatly into place, and anybody who falls for a particularly long distance will always leave a mess afterward. You’ll learn those lessons the hard way when you brave the treacherous roads of Hill Climb Racing. In this challenging 2D side-scroller, you will drive your car up and down one steep incline after another. Does it sound easy? It’s not. Your vehicle is almost as wobbly as a noodle, the roads are uneven, and every little motion you make will threaten to flip your machine onto its back. If you want to get through this ordeal without causing your insurance rates to skyrocket, then you’ll have to learn how to take absolute perfect control of your speed and maneuverability. Hill Climb Racing is easy to learn and hard to master. The game provides responsive touchscreen controls that give you as much control of the car as you need. Take full advantage of them; one slip up is going to bring this road trip to a very abrupt end. Step on the gas pedal to your right to move the car forward and increase its speed. Hit the brake to the left to slow down. Maintain the tilt of your vehicle whenever it gets at least partially airborne. You don’t want your head to hit the dirt. Be efficient with your fuel; your tank can only carry so much. Grab every drop of gasoline that you can find. Roll through 11 distinct levels, such as a country road, a sandy desert, and even the surface of the moon. Drive forever and ever. The trip won’t end until you crash or run out of gas. The jeep may be a great off-road vehicle, but you can always do better than what you start out with. As you drive across these hilly roads, you’ll find a surprisingly large amount of loose change lying around. Grab as much of it as you possibly can; you just might be able to purchase some better stuff for your vehicle of choice. Unlock a wide range of vehicles, including a jeep, a racecar, a motorcycle, a tank and more. Improve your speed and acceleration by outfitting your ride with a new engine. Give your car better tires and suspension to provide it with more stability in the air. Get 4WD to make driving up the steepest hills a cakewalk. Hill Climb Racing is a game of skill that you should always strive to improve in. There are a lot of metrics involved that determine just how well you are doing. All of them will be recorded for you and everyone else to see, so be sure to give it your best. Measure the distance for how far you can drive before flipping over. Count the number of coins you managed to collect over the course of your travels. List the dangerous and crazy stunts you were able to pull and live through. Make screenshots and post your best scores online to show everyone how much of a maniac you are behind the wheel. 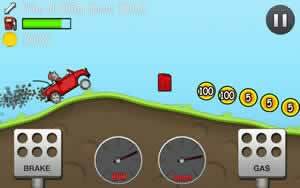 Hill Climb Racing is one of the most challenging mobile titles you are sure to find. It is also one of the most downright addictive. With the crazy physics, the wacky stunts you can pull off, and the constant life-and-death struggles you are put through, you may find it very hard to put it down. 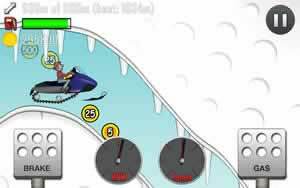 Step on the pedal and ride the never-ending rollercoaster that is Hill Climb Racing today! In the world of gaming, driving is always a competitive sport that pits you against an opponent of sorts. Usually, it's at least one other racer. Sometimes, it's just the clock. 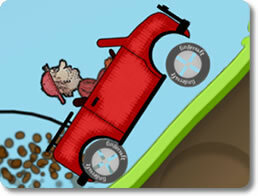 In Hill Climb Racing, your archenemy is nothing less than the force of gravity. Gravity will try to pull you down as you struggle to climb a hill in your rinky-dink off-road vehicle. Gravity will force you to fall fast as you roll down a sheer cliff. Most of all, gravity will attempt to flip you over so that your neck snaps when it hits the ground. Gravity is indeed a harsh mistress in Hill Climb Racing. While that might sound mundane compared to your usual racer, you'll quickly realize that's all you'll need for an engaging driving experience. Hill Climb Racing doesn't look like much. The graphics are completely flat, most levels are bland-looking, and there's just not a whole lot of style or personality to the aesthetics. They're by no means terrible; everything looks like they're supposed to be. They just look like generic vector graphics that we've been seeing in Flash games for years now. Luckily, there is one saving grace to the visuals. The physics are exaggerated to comical effect. Your car will bob up and down at the slightest bump, struggle to ascend the steepest inclines, and roll in the air like a lopsided boomerang. If you can maintain a delicate balance, then it's possible to even drive your vehicle on either its nose or its rear wheels. For what it's worth, the developers did take a little bit of care in animating the car while it's in motion as well. Both the driver's head and the car antenna will bounce to and fro as you accelerate, brake and fall. There's even a bit of morbid humor to be found when you crash and hear the audible snap of the driver's neck breaking. It's a very amusing game to see in action. What's not so forgivable in Hill Climb Racing is the music. The tune that plays in every level is suitably bouncy and energetic, but it's also awfully short. This results in a song that's going to repeat itself over and over again until you feel the need to just mute the sound entirely before it drives you crazy. The premise behind Hill Climb Racing is right there in its title. Taking control of a crazy hillbilly, you're tasked with driving an off-road vehicle of sorts over and across hilly terrain. It plays like a combination of a driving game and a 2D platformer, with a healthy dose of physics thrown in for good measure. There are only two controls you have at your fingertips: acceleration and braking. Both of these are operated via the gas pedal and brake buttons you see onscreen. The object is to get as far as you can without crashing. Believe it when you're told that this game desperately wants you to crash. The inclines you have to ascend are often very steep, you'll face a lot of long drops, and even going too fast on a small bump can make you airborne. As stated before, the physics of Hill Climb Racing are whacked out; keeping your ride steady and your neck straight is going to be a tough balancing act of knowing when to step on the gas and when to slam on the brakes. You might be tempted to just take thing slow and steady then, but you better slow down there. In truth, you should speed up. Gas is a constant concern, as your vehicle will constantly burn it up. You need to stay on the move, grabbing every last gasoline canister you come across to stay fueled up. Your game won't be any less over once your fuel gauge starts pointing at the E-mark. Needless to say, Hill Climb Racing is pretty tough. Speeding up puts you in danger of flipping over, but slowing down will drain your gas quickly. Then there's the bumpy terrain you have to contend with. The end result is that it's actually a lot of fun! The game may be unforgiving, but it never feels cheap. While the controls might seem a little odd at first, with the brake effectively causing your ride to tilt backwards, they're not so bad once you get used to them. Everything requires a precise amount of skill. If you crash, it won't feel like the game messed you up; it will feel like you're the one who made a mistake. There will be a fair amount of trial and error on some of the tracks, especially the later parts, but practice can give you the finesse you need to proceed, provided you have a good memory. Hill Climb Racing is already a fun game, but the deal is sweetened further with the number of goodies you can unlock over its course. As you race through the tracks, you'll collect all sorts of coins. You can use these in between runs to buy all sorts of stuff in-game. The first and most obvious of these are vehicle upgrades. While not a particularly deep system, as upgrades are linear and portrayed in the form of increased levels with no drawbacks, it can still be fun to improve various aspects to your vehicle. You can upgrade your engine, suspension, tires and tank, improving your speed, stability, climbing ability and fuel capacity respectively. The next things you can get are additional tracks. The first few of these you'll undoubtedly unlock aren't really anything to get excited about. They feature hilly terrain for sure, but they all feel pretty generic, with the main difference being how the ground is colored. Later tracks get a lot more interesting in both looks and road design. One is modeled after a roller coaster that comes with loop the loops, while another takes place on a volcano where you have to leap over pools of burning lava. These levels are a lot of fun to traverse and have better aesthetics than the earlier ones. Finally, you have over a dozen vehicles to try. You'll start out with a pretty basic jeep, but you can also drive more exotic things like a motorcycle, a race car or even a tank. While all the vehicles have the same controls, their different shapes and weight distributions help them feel a little distinct from one another. While there certainly could have been more to differentiate one ride from another, there's still enough to make some more strategic to use on different tracks than others. While there's certainly a lot to look forward to in Hill Climb Racing, it's annoying how pricey a lot of the later items can get. It takes a lot of grinding to build up the reserves needed to get just one new item, as they can easily run for over a million coins each. The game is fun and all, there's only so much you can do before the grind wears your patience thin. Mediocre presentation and some repetition aside, Hill Climb Racing is still a fun game that never fails to amuse. Driving a good distance on hazardous terrain feels like an accomplishment, and watching the poor driver crash doesn't get old. With a price tag of zero dollars, you could do a whole lot worse. Get Hill Climb Racing now.